I often contemplate which ecosystem I would prefer to be lost in, should such an unfortunate fate befall me. Would I choose the forests of my youth, with bone chilling winter temps and blood-sucking summer ticks perhaps being my biggest threat? The mountains, with its unpredictable, chaotic weather? Canyons, easier to navigate, but a flash flood risk? The open ocean? 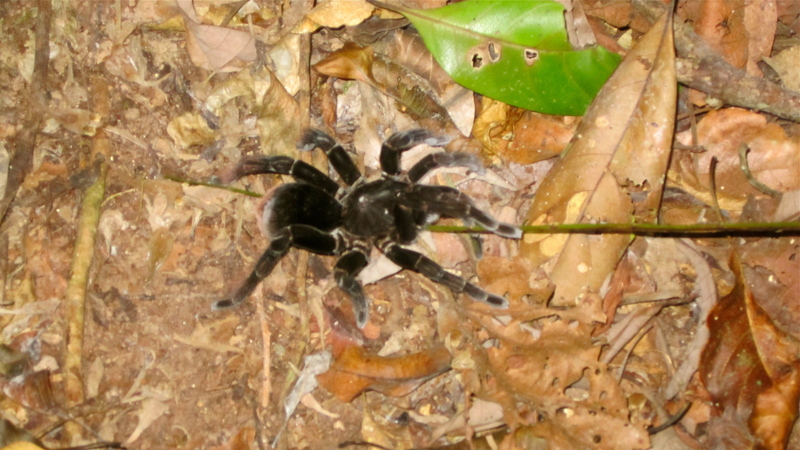 As we set out on our guided jungle night hike, I occasionally felt too co-dependent. Co-dependent on Victor, our guide, who navigated twists and turns with ease, as stealth as possible in the pitch black. My normal attempt to mentally check off navigational features was useless. I was lost. And then you realize you are surrounded by critters. There, in the tree, a cat eye snake. 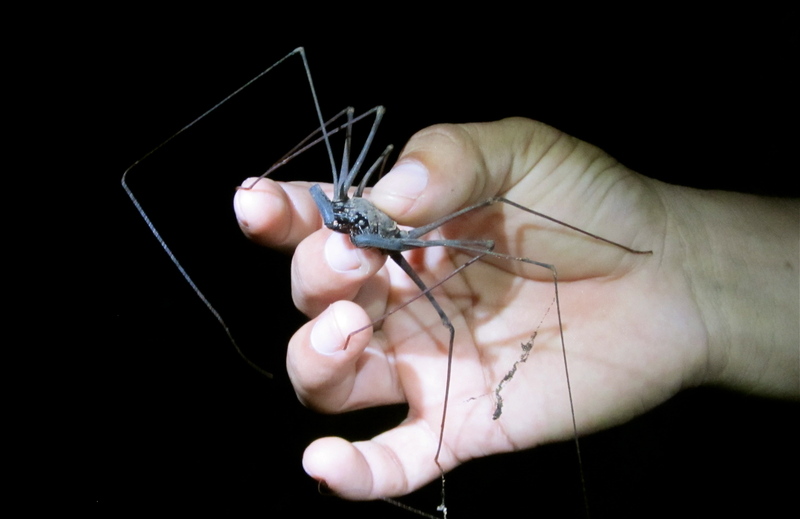 Here, in the leaves, a whip tail scorpion. Over here, a tarantula. 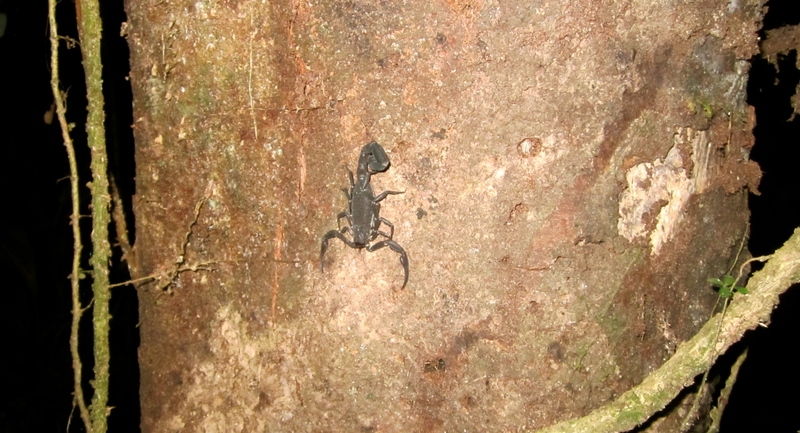 Check out this black scorpion clinging to the tree. There, a rainbow boa! The following day we set off early to track down parrots and macaws visiting a clay lick. Our chances appeared slim when we spotted a roadside hawk parked casually in the treetop, waiting patiently for his breakfast. So we hiked in farther. The jungle became louder and louder with the chatter of hundreds of birds. 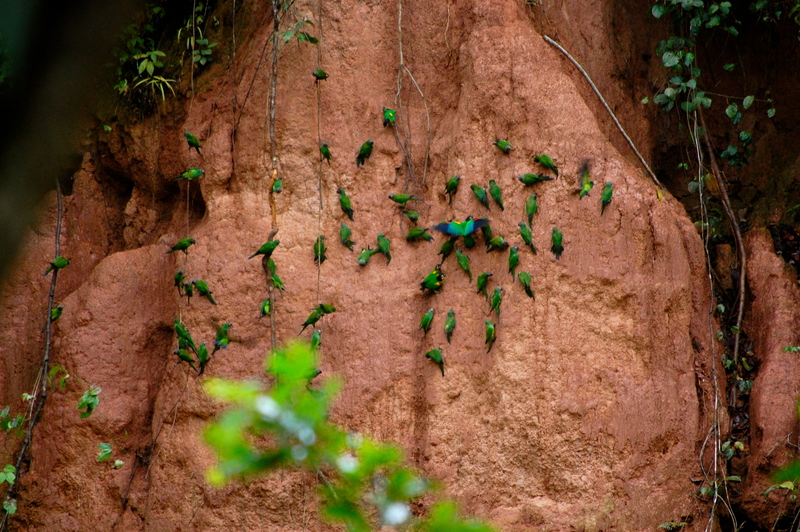 You have a very small window of opportunity to see parrots and macaws at a clay lick. But there they were, engaged in their routine early morning frenzy. Victor took us fishing later at a swamp. 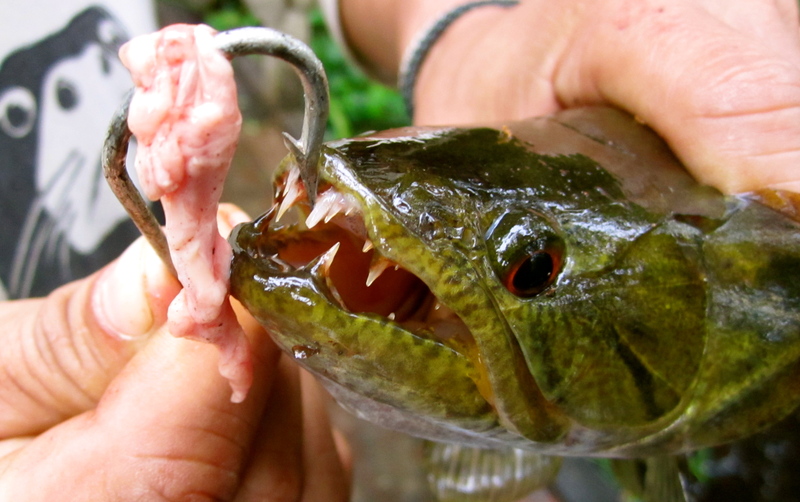 We used bamboo sticks, a line and hook, and meat he pilfered from the kitchen back at the lodge. We didn’t pull in any piranha, but the dog fish were biting. We hooked several. Correction: Victor caught three, my wife caught one, I caught none. 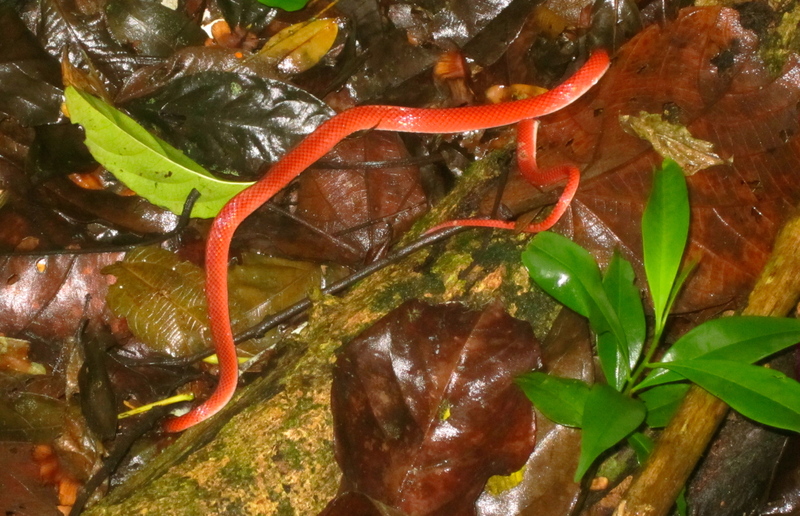 On our way there, we found a mussurana (snake) hanging out on the trail. 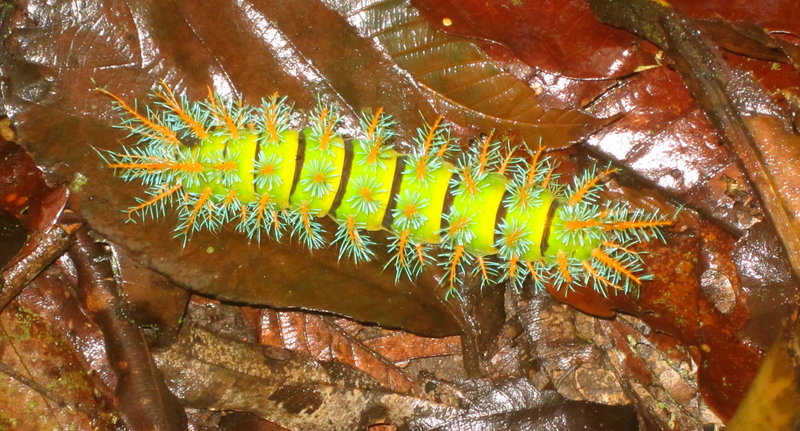 We also came across a poisonous caterpillar looking like he was on his way home from the disco. The only relief from his painful sting is his blood. So which ecosystem would I reluctantly choose to be lost in? I can now confidently cross the jungle off that list.